Sheetal Shetty is an 18 year old young woman from Mumbai. She works as a ‘Coach’ on the Goal program of the Naz Foundation India Trust. Her mother works as a security guard, and brought up her two children single handedly. Sheetal is currently working as a ‘Coach’ on the Goal program which is a Women’s Empowerment initiative at The Naz Foundation India Trust. She delivers lifeskills and netball sessions to adolescent girls on the Goal program at two of the different Municipal schools where Goal is implemented and she also mentors other young women on Goal. 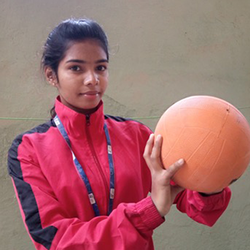 Sheetal was a participant of the Goal program at Globe Mill Passage school in Elphinstone Road in 2008. After she graduated from the program, she signed up to be a Peer Leader on Goal helping the team to deliver sessions and building on her leadership skills. Due to her innate ability, her confidence and eagerness to make a difference in her community, she was recruited as a Community Sports Coach on Goal in 2013 and was promoted to the position of junior coach in May 2015. As a facilitator, among all the sessions, Sheetal particulalry loves to deliver the session on HIV / AIDS and believes that every girl should be about these issues. Sheetal is pursuing her studies and is in the first year of B.Com from the Maharshi Dayanand College. She wishes to study further and become a company secretary (CS). Sheetal is extremely interested fashion and modelling.